We have used various resources for our maps because it is difficult to find one map that depicts locations for many of Native tribes. There are several reasons for this. Some tribes led nomadic lifestyles and continuously moved to follow buffalo herds or other animals. Over time they ended up in areas different from their original tribal grounds. Others moved to escape confrontations with other tribes; while many Natives were forcibly displaced (e.g., the Cherokees, Choctaw, Navajo etc.) by the U.S. government. The end result is that today many Native Americans are not living in the locations where their ancestors originally lived. Finding out this information would require several maps. 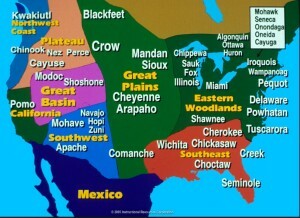 It should be noted that there are some tribes that managed to never move from their original area. An example would be the Zuni of New Mexico. The Zuni are distinct in that they have managed to remain quite unaffected by outer influences over the years. They still claim the same land they always lived on, an area about the size of Rhode Island. 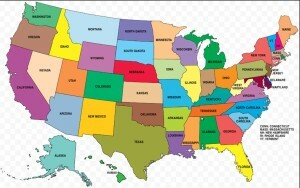 They also mainly reside in one city — Zuni, New Mexico. It should also be noted that this is an ongoing process and Native maps will be added over a period of time. In the meantime there are several good books available that offer both informative text, illustrations, and maps to help you trace the origins of for many of the tribes. 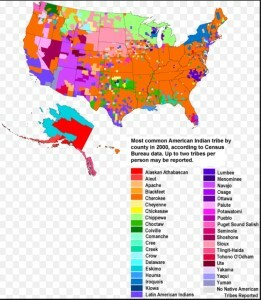 We have found that the site with the best Native maps is Native-Languages.org We found their maps to be clear and easy for everyone to understand. The maps have been added to the pages of the particular tribes listed in Tribalpedia. Here are several maps we found that may be helpful for overall information.